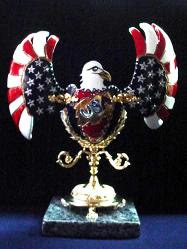 All Handmade Art/Crafts by...Artist Mary Gonzalez at MJ Crafts Design Studio: The "Eggypiece Collection" Masterpiece! This "Eggypiece" is created 100% Handmade by Mary. Hand-carved, hand-painted, hand-designed detail by detail. Decorated and embellished with Swarovski Crystals. Mounted in a gold-plated stand and finished with a granite stone tile. Just unique! More images soon!